As my metalsmithing skills grow, I've been toying with the idea of buying a grown-up torch, but to be honest, I'm a little scared to keep it in the house. My studio is a second floor, extra-bedroom I've taken over and the thought of keeping something that could blow us all up when we sleep, is a little unsettling. A big-girl torch is not off the table, but for the moment, let me sing the praises of what I have been using. The Micro-Torch, aka the Creme Brulee Torch or the Butane Torch. It's mini, but it's mighty. The Pros: It's inexpensive, low maintenance, doesn't take up a lot of space and is less likely to blow your house up then an oxygen/acetylene torch. The Cons: It's really best for small pieces, as in an inch diameter or less. For larger pieces you need more heat, although you can also use two micro torches at the same time for some things...awesome, I know. 1. Enamel. You can enamel small pieces with your micro-torch. I started with pennies. Copper is a great metal for enameling. You clean it with Penny Brite, sift the enamel on, position it on your firing station and then use your micro torch to heat it from underneath. Here's a video from Stephen James, the teacher I learned from. 2. Fuse. I am obsessed with fusing fine silver and I've based a whole new collection on this technique. I've been making earrings, bracelets and today I began working on a necklace design. The Earrings at the top of the post are made from 16 gauge fine silver wire that is fused with a micro torch and then hammered, textured and adorned with crystals. You can find them in my Etsy Shop. 3. Solder. Yes, you can solder with a Micro-torch. 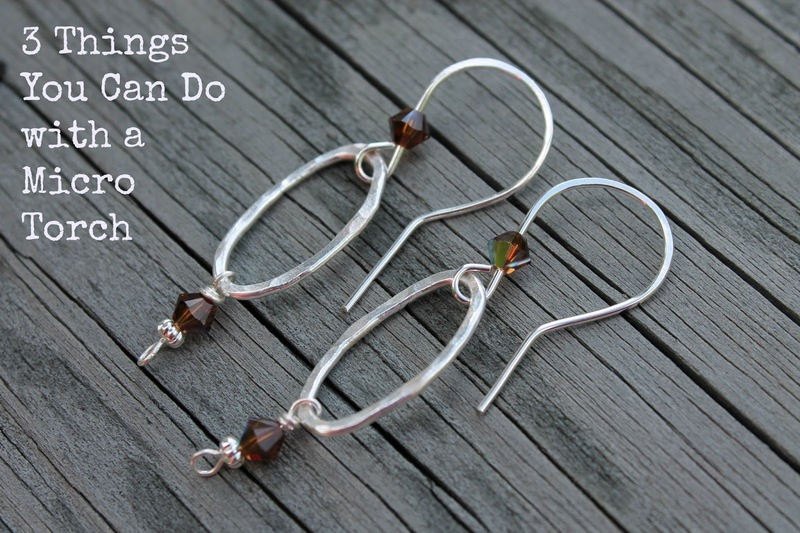 I particularly like to use it to create earring posts, but I've also used it for joining sterling silver wire and copper wire. Again, for larger pieces you may need two torches, but for my needs, I only have used one. There are many more things you can do with your Butane Torch, other than just browning the top of a dessert, but this is probably enough to digest for today. ps: There are also many ways to make great jewelry without a torch. Check out my upcoming classes in the Syracuse Area right here.